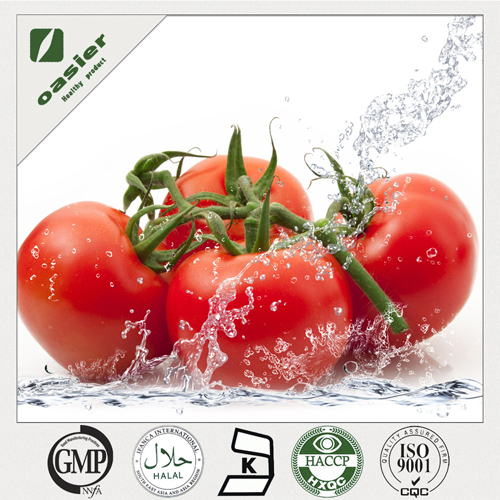 The key to anti-aging - antioxidant: ② Lycopene - Baoji Oasier Bio-Tech Co., Ltd.
Lycopene, a carotenoid that does not have the original activity of vitamin A, was originally found to be derived from the study of deep yellow and red pigments. Some studies found that a large number of Mediterranean residents eat a lot of fruits and vegetables, especially tomatoes, and their incidence of cardiovascular disease and prostate cancer is lower than in other regions. In the past 20 years, more and more research and investigations at home and abroad have shown that lycopene can quench active oxygen, eliminate free radicals, prevent heart disease, slow atherosclerosis, prevent multiple types of cancer, protect cardiovascular, Anti-aging, skin protection and other physiological functions. Lycopene is the most effective singlet oxygen quencher in carotenoids. Its quenching ability is twice that of beta carotene and 100 times that of vitamin E. Therefore, its antioxidant activity is the most strong among carotenoids. In addition, the anti-cancer and anti-cancer effects of lycopene are also significantly better than those of alpha-carotene and beta-carotene. At present, the research of lycopene has become a hot topic in the analysis of functional food components and anticancer and anticancer research in the world. This product has been widely used in foreign countries for food additives, functional foods and other industries, such as healthcare products for prevention of prostate disease, and complex functional foods with carotenoids, β-carotene, lutein and other carotenoids.